A focus of the probe is whether payments for multi-million dollar residences were processed through a Nissan unit in the Netherlands called Zi-A Capital BV and its subsidiaries, which had been set up to invest in tech startups. 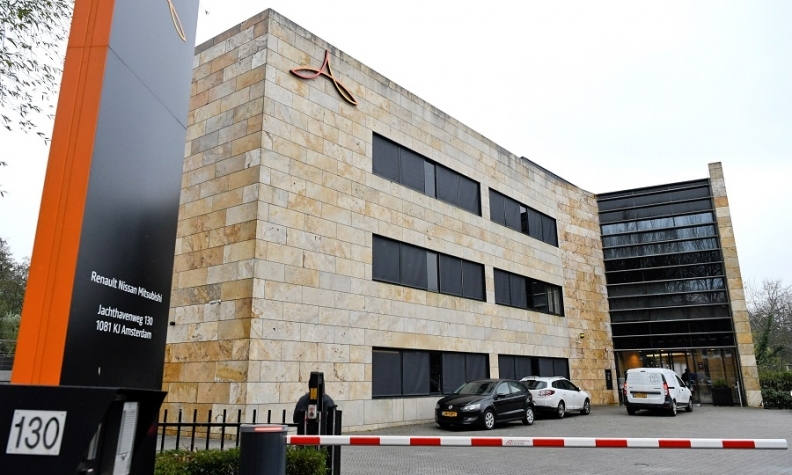 Pictured is the Renault-Nissan alliance headquarters in Amsterdam. YOKOHAMA, Japan -- Nissan Motor Co. investigators are examining former Chairman Carlos Ghosn's use of a so-called internal CEO reserve fund and the role of subsidiaries in the Netherlands and other countries as part of a probe into alleged financial misconduct, two people with knowledge of the inquiry told Reuters. Ghosn and close associates spent money from a fund that some insiders dubbed 'the CEO Reserve' to help pay for residences used by the Ghosn family as well as for other personal expenses, the people said. The existence of the fund and the investigators' scrutiny of how the subsidiaries' capital was used is being reported by Reuters for the first time. Nissan spokesman Nick Maxfield said the Japanese automaker was still looking into the nature and extent of what it calls the misconduct by Ghosn. "We are unable to comment on the specifics of the ongoing investigation at this time," he said. In response to questions from Reuters about 'the CEO Reserve' fund and other issues, two Ghosn representatives in the United States said they were unable to comment because they were not sufficiently familiar with the details. Until recently one of the auto industry's most celebrated executives, Ghosn was seen as the anchor of Nissan's alliance with Renault SA and Mitsubishi Motors Corp. He has since been fired as chairman of Mitsubishi although Renault has stopped short of dismissing him from its helm. Done that way, the transactions may have escaped the attention of finance people within Nissan, Nissan's auditors and employees affiliated with the Nissan-Renault alliance, the people said. "Why would (internal financial staff) go in and check one-million-dollar transactions in a subsidiary five, six levels or layers down and away from the global headquarters? They wouldn't do that," one individual familiar with the inquiry said. "Especially when amounts are less than one million dollars," the individual said. Ghosn's legal defense partly rests on the assertion that his compensation arrangements were vetted internally and by outside consultants, people familiar with the matter said. They did not identify the Nissan staff and external consultants who were in charge of the vetting. His co-defendant, former representative director Greg Kelly, who has been accused by prosecutors of conspiring with Ghosn about his compensation, has denied the allegations. Kelly's lawyer, Yoichi Kitamura, said he was unaware of the content of Nissan's internal probe and was confident his client will be cleared of the charges brought against him. The role of two of Zi-A Capital BV's subsidiaries, Zi-A Capital in Dubai and Hamsa Holdings in the British Virgin Islands, are also being checked by investigators, one of the people with knowledge of the probe said. Nissan's auditor, Ernst & Young ShinNihon, questioned the automaker's management several times, chiefly around 2013, about purchases of overseas luxury homes for Ghosn’s personal use and of stock-appreciation rights that were conferred on him, a person with direct knowledge of the matter has said. Nissan declined to comment. A representative for Ernst & Young ShinNihon could not immediately reached for comment. A spokesman for the auditor has previously said he could not comment on specific cases when asked about the matter. The CEO Reserve was set up to pay for unplanned business needs and could at times contain 'a few hundred million dollars,' one of the people with knowledge of the inquiry said. "For example, if you have an autonomous drive company you'd want to buy right now, you'd use that budget," the second person with knowledge of the matter said.